This article is about the Soviet Army between 1946 and 1991. For the army of the U.S.S.R. until 1946, see Red Army. The Soviet Army (Russian: Советская Армия, Sovetskaya Armiya) is the name given to the main land-based branch of the Soviet Armed Forces between February 1946 and December 1991, when it was replaced with the Russian Ground Forces, although it was not taken fully out of service until 25 December 1993. Until 25 February 1946, the force was known as the Red Army, established by decree on 15 (28) January 1918 "to protect the population, territorial integrity and civil liberties in the territory of the Soviet state." At the end of the Second World War the Red Army had over 500 rifle divisions and about a tenth that number of tank formations. Their experience of war gave the Soviets such faith in tank forces that from that point the number of tank divisions remained virtually unchanged, whereas the wartime infantry force was cut by two-thirds. The Tank Corps of the late war period were converted to tank divisions, and from 1957 the Rifle Divisions were converted to Motor Rifle Divisions (MRDs). MRDs had three motorized rifle regiments and a tank regiment, for a total of ten motor rifle battalions and six tank battalions; tank divisions had the proportions reversed. The Land Forces Chief Command was created for the first time in March 1946. Four years later it was disbanded, only to be formed again in 1955. In March 1964 the Chief Command was again disbanded but recreated in November 1967. Marshal of the Soviet Union Georgi Zhukov became Chief of the Soviet Ground Forces in March 1946, but was quickly succeeded by Ivan Konev in July, who remained as such until 1950, when the position of Chief of the Soviet Ground Forces was abolished for five years, an organisational gap that “probably was associated in some manner with the Korean War”. From 1945 to 1948, the Soviet Armed Forces were reduced from ca. 11.3 million to ca. 2.8 million men, a demobilisation controlled first, by increasing the number of military districts to 33, then reduced to 21, in 1946. The personnel strength of the Ground Forces was reduced from 9,822,000 to 2,444,000. To establish and secure the USSR’s eastern European geopolitical interests, Red Army troops who liberated Eastern Europe from Nazi rule, in 1945 remained in place to secure pro–Soviet régimes in Eastern Europe and to protect against attack from Europe. Elsewhere, they may have assisted the NKVD in suppressing anti-Soviet Western Ukrainian resistance (1941–55). Soviet troops, including the 39th Army, remained at Port Arthur and Dalian on the northeast Chinese coast until 1955. Control was then handed over to the new Chinese Communist government. Soviet Army forces on USSR territory were apportioned among military districts. There were 32 of them in 1945. Sixteen districts remained from the mid-1970s to the end of the USSR (see table at right). Yet, the greatest Soviet Army concentration was in the Group of Soviet Forces in Germany, which suppressed the anti-Soviet Uprising of 1953 in East Germany. East European Groups of Forces were the Northern Group of Forces in Poland, and the Southern Group of Forces in Hungary, which put down the Hungarian Revolution of 1956. In 1958, Soviet troops were withdrawn from Romania. The Central Group of Forces in Czechoslovakia was established after Warsaw Pact intervention against the Prague Spring of 1968. In 1969, at the east end of the Soviet Union, the Sino-Soviet border conflict (1969), prompted establishment of a 16th military district, the Central Asian Military District, at Alma-Ata, Kazakhstan. In 1979, the Soviet Union entered Afghanistan, to support its Communist government, provoking a 10-year Afghan mujahideen guerrilla resistance. The Central Asian Military District was dissolved in 1988 and the Volga and Urals Military Districts merged around 1991. Throughout the Cold War (1945–91), Western intelligence estimates calculated that the Soviet strength remained ca. 2.8 million to ca. 5.3 million men. To maintain said strength range, Soviet law minimally required a three-year military service obligation from every able man of military age, until 1967, when the Ground Forces reduced it to a two-year draft obligation. By the middle of the 1980s the Ground Forces contained about 210 divisions. About three-quarters were motor rifle divisions and the remainder tank divisions. There were also a large number of artillery divisions, separate artillery brigades, engineer formations, and other combat support formations. However, only relatively few formations were fully war ready. Three readiness categories, A, B, and V, after the first three letters of the Cyrillic alphabet, were in force. The Category A divisions were certified combat-ready and were fully equipped. B and V divisions were lower-readiness, 50–75% (requiring at least 72 hours of preparation) and 10–33% (requiring two months) respectively. The internal military districts usually contained only one or two A divisions, with the remainder B and V series formations. Soviet planning for most of the Cold War period would have seen Armies of four to five divisions operating in Fronts made up of around four armies (and roughly equivalent to Western Army Groups). In February 1979, the first of the new High Commands in the Strategic Directions were created at Ulan-Ude. These new headquarters controlled multiple Fronts, and usually a Soviet Navy Fleet. In September 1984, three more were established to control multi-Front operations in Europe (the Western and South-Western Strategic Directions) and at Baku to handle southern operations. In 1955, the Soviet Union signed the Warsaw Pact with its East European satellite states, formalising Soviet military control over their armed forces. 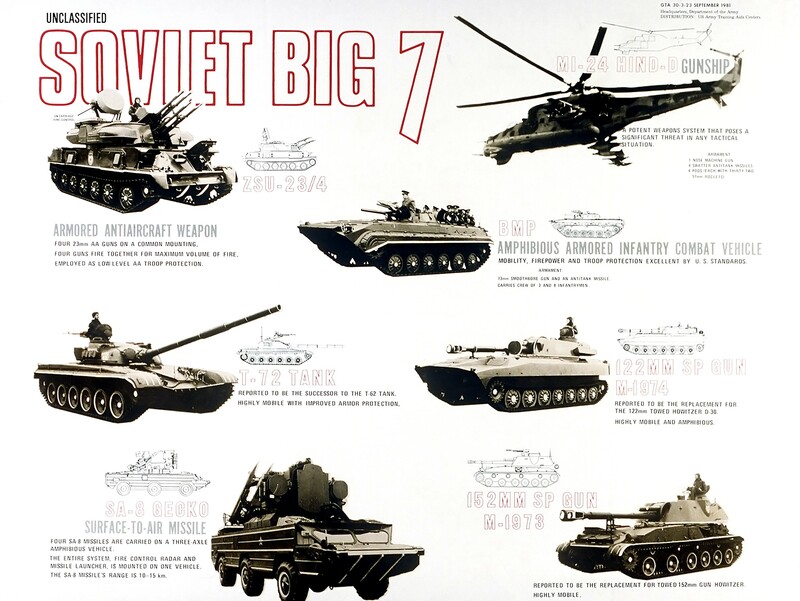 The Soviet Army created and directed the Eastern European armies in its image for the remainder of the Cold War, shaping them for a potential invasion of Western Europe. After 1956, Premier Nikita Khrushchev reduced the Ground Forces to build up the Strategic Rocket Forces — emphasizing the armed forces' nuclear capabilities. He removed Marshal Georgy Zhukov from the Politburo in 1957, for opposing these reductions in the Ground Forces. Nonetheless, Soviet forces possessed too few theater-level nuclear weapons to fulfil war-plan requirements until the mid-1980s. The General Staff maintained plans to invade Western Europe whose massive scale was only made publicly available after German researchers gained access to National People's Army files following the dissolution of the Soviet Union. From 1985 to 1991, Soviet President Mikhail Gorbachev attempted to reduce the Soviet Army’s financial straining of the USSR’s economy; he slowly reduced its size, and withdrew it from Afghanistan in 1989. After the 19–21 August 1991 Soviet coup d'état attempt to depose President Gorbachev, the Academy of Soviet Scientists reported that the armed forces did not much participate in the coup launched by the neo-Stalinists in the CPSU. Commanders despatched tanks into Moscow, yet the coup failed. On 8 December 1991, the presidents of Russia, Belarus, and Ukraine formally dissolved the USSR, and then constituted the Commonwealth of Independent States (CIS). Soviet President Gorbachev resigned on 25 December 1991; the next day, the Supreme Soviet dissolved itself, officially dissolving the USSR on 26 December 1991. During the next 18 months, inter-republican political efforts to transform the Army of the Soviet Union into the CIS military failed; eventually, the forces stationed in the republics formally became the militaries of the respective republican governments. After the dissolution of the Soviet Union, the Soviet Army dissolved and the USSR's successor states divided its assets among themselves. The divide mostly occurred along a regional basis, with Soviet soldiers from Russia becoming part of the new Russian Army, while Soviet soldiers originating from Kazakhstan became part of the new Kazakh Army. As a result, the bulk of the Soviet Ground Forces, including most of the Scud and Scaleboard surface-to-surface missile forces, became incorporated in the Russian Ground Forces. By the end of 1992, most remnants of the Soviet Army in former Soviet Republics had disbanded. Military forces garrisoned in Eastern Europe (including the Baltic states) gradually returned home between 1992 and 1994. This list of Soviet Army divisions sketches some of the fates of the individual parts of the Ground Forces. In mid March 1992, Russian President Boris Yeltsin appointed himself as the new Russian minister of defense, marking a crucial step in the creation of the new Russian armed forces, comprising the bulk of what was still left of the military. The last vestiges of the old Soviet command structure were finally dissolved in June 1993, when the paper Commonwealth of Independent States Military Headquarters was reorganized as a staff for facilitating CIS military cooperation. In the next few years, the former Soviet Ground Forces withdrew from central and Eastern Europe (including the Baltic states), as well as from the newly independent post-Soviet republics of Azerbaijan, Armenia, Uzbekistan, Kazakhstan, Turkmenistan and Kyrgyzstan. Now-Russian Ground Forces remained in Tajikistan, Georgia and Transnistria. 55,000 tanks, including 4,000 T-80, 10,000 T-72, 9,700 T-64, 11,300 T-62, 19,000 T-54/55, and 1,000 PT-76. 70,000 armored personnel carriers, including BTR-80, BTR-70, BTR-60, BTR-D, BTR-50, BTR-152, and MT-LB. 24,000 infantry fighting vehicles, including BMP-1, BMP-2, BMP-3, BMD-1, BMD-2, and BMD-3. 3,500 BRDM-2 and BRDM-1 reconnaissance vehicles. 33,000 towed artillery pieces, including 4,379 D-30, 1,175 M-46, 1,700 D-20, 598 2A65, 1,007 2A36, 857 D-1, 1,693 ML-20, 1,200 M-30, 478 B-4 howitzers and D-74, D-48, D-44, T-12, and BS-3 field/anti-tank guns. 9,000 self-propelled howitzers, including 2,751 2S1, 2,325 2S3, 507 2S5, 347 2S7, 430 2S4, 20 2S19, 108 SpGH DANA, ASU-85, and 2S9. 8,000 rocket artillery, including BM-21, 818 BM-27, 123 BM-30, 18 BM-24, TOS-1, BM-25, and BM-14 multiple rocket launchers. Scud, OTR-21 Tochka, OTR-23 Oka, and 9K52 Luna-M tactical ballistic missiles. 1,350 2K11 Krug, 850 2K12 Kub, 950 9K33 Osa, 430 9K31 Strela-1, 300 Buk missile system, 70 S-300 (missile), 860 9K35 Strela-10, 20 Tor missile system, 130 9K22 Tunguska, ZSU-23-4, and ZSU-57-2 army air defense vehicles. 12,000 towed anti-aircraft guns, including ZU-23-2, ZPU-1/2/4, 57mm AZP S-60, 25mm 72-K, 61-K, 52-K, and KS-19. 4,300 helicopters, including 1,420 Mi-24, 600 Mi-2, 1,620 Mi-8, 290 Mi-17, 450 Mi-6, and 50 Mi-26, 6 experimental Mi-28 and 2 Ka-50. In 2007, the World Bank estimated that out of the 500 million total firearms available worldwide, 100 million were of the Kalashnikov family, and 75 million were AK-47s. However, only about 5 million of these were manufactured in the former USSR. ↑ Schofield, Carey (1991). Inside the Soviet Army. London: Headline Book Publishing PLC. pp. 236–237. ISBN 0-7472-0418-7. ↑ Killicoat, Phillip (Economics) (April 2007). "Weaponomics: The Global Market for Assault Rifles" (PDF). Worldbank. Post-Conflict Transitions Working Paper No. 10.. Oxford University.. http://www-wds.worldbank.org/servlet/WDSContentServer/WDSP/IB/2007/04/13/000016406_20070413145045/Rendered/PDF/wps4202.pdf. Retrieved 3 April 2010. Lee, Rensselaer (1999) Smuggling Armageddon: The Nuclear Black Market in the Former Soviet Union and Europe. New York: St. Martin’s Press. Wikimedia Commons has media related to Category:Army of the Soviet Union.